Since January 2007 I have occupied one of the specialist posts available to the major disciplines for the Outreach Programme based at Grey's Hospital, Pietermaritzburg. This is a programme of interaction between the tertiary hospital and the district hospitals it sub-serves. Dublin-based Canadian students Ashley, Dena and Megan showed me their medical school journal, and set perceptive questions. 1. What is the population served? There are three health areas in Kwazulu-Natal (KZN). Ours is Area 2, which covers the western half of the province and has been designated as a pilot area for liaison between Grey's Hospital and 20 district hospitals. The population is 3 million, mostly relying on public health services. Stalwarts like Jim Muller (Internal Medicine) and Neil McKerrow (Paediatrics) have had Outreach in Area 2 on the go for 25 years. 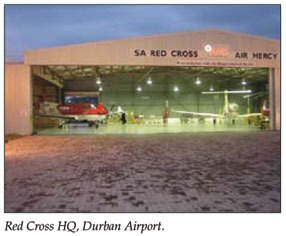 The formal agreement 10 years ago between the KZN Department of Health and the Red Cross Air Mercy Service put transporting on a firm foundation. In 2006 posts were created at principal specialist level in all the major disciplines specifically for Outreach. 3. How many specialists participate in the programme, and how is their participation organised? Three posts are currently filled, with clinical, educational and communication responsibilities over a vast geographical region. Every district hospital should have a regular monthly visit with only one discipline per visit. The day should be structured, with clinical and teaching rounds and a formal tutorial for all medical staff. It is not feasible for an individual consultant to achieve this. In a well-established department like Internal Medicine, where there are 14 consultants, the aim is therefore for each doctor to 'adopt' a hospital to visit regularly, or to rotate through different hospitals, especially if the consultant has a subspecialty. A majority 'buys in' to this concept: a minority does not. Currently there are half-a-dozen hospitals consistently under my care, one or two too many. 4. How is the programme funded? Funding is from the KZN provincial health budget. This pays the salaries of the Outreach consultants and the transport bill. The programme is co-ordinated by Red Cross but overseen by a provincial committee. Organised air and road transporting is key to its success. The single turbo-prop Swiss Pilatus planes are robust and reliable, the pilots outstanding, and Kogie and her Red Cross team ever amenable. 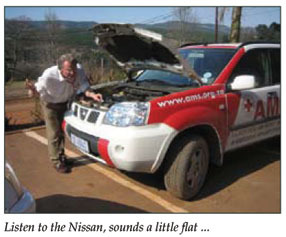 We have a Nissan X-Trail with a regular driver, for hospitals closer to Pietermaritzburg. 5. What are the goals of the programme? Interaction between the tertiary hospital and the district and regional hospitals that fall into its area includes the development of support, with emphasis on clinical monitoring and educational activities. Goals include co-ordination of specialist services to ensure equitable distribution of all resources and achieve optimal patient care. The theoretical side fits in very well with the government's 'BATHO PELE  people first' principles: Consultation, Service Standards, Accessibility, Courtesy, Information, Transparency, Redress, Value for money, Innovation and reward thereof, Impact on 'customer', Leadership and strategic direction. 6. What are the major problems facing rural health care in KZN? What is being done to alleviate them? What more needs to be done? AIDS/TB is a simple answer: South Africa is world champ for the combination. The government is now being proactive in combating the former. The discrepancy between what is available at peripheral hospitals compared with central ones is stark, even though a primary health care system has long been successful in rural KZN. Outreach is part of the attempt to address this issue. Much more needs to be done: the surface is barely scratched. Political will and commitment to service delivery are vital. 7. What has been the impact of the Outreach programme? Not sure yet, overall. However, regular visits improve the indications for, and the standard and ease of, referral. One sees a rise in morale and enthusiasm of recipient doctors within months. 8. Are there any success stories or personal experiences from the Outreach programme that stand out in your mind? We established that it was a silent heart attack that caused an octogenarian to fall off her bicycle during her daily round-town jaunt. Last week granny was back on her bike, having walked for a month on doctor's orders. At remote COSH  Church of Scotland Hospital at Tugela Ferry, where XDR-TB reared its ugly head  stability is ensured by three doctors whose combined service there exceeds 60 years. Similarly, at Emmaus Hospital an excellent young doctor has guaranteed tenure by marrying a local farmer. Who will forget a sunset over the Drakensberg at Glenside while hoping that the remaining passenger will arrive before darkness prevents take-off? The airstrip's resident cat stalks Poppy, our felinophobic flight co-ordinator. Wow. Half-Wings-Physician Bigglesworth at your service. I did get half-wings: at the 10th anniversary celebration of the Red Cross AMS/KZN-Health liaison. Although merely representative of those who fly with AMS, I was unexpectedly emotional about it. Something to do with a navigator uncle I never met because he was shot down aged 20: half-wings  he could not land aeroplanes. And a father who had much Red Cross involvement as a mine doctor became a deputy commissioner shortly before he died. And another uncle who flew Lancaster bombers with a DFC to his name. On behalf of the family: and AMS flight co-ordinator Trish, who at 70 still looks after us, having volunteered for the Red Cross aged 14. 9. How has the HIV epidemic changed health care in KZN? How has it impacted on your career specifically? In 1988 I had the dubious distinction of being in charge of the first female inpatient diagnosed with AIDS at Edendale Hospital. Within 3 years 70% of the occupants of that ward would have HIV-AIDS, and this now applies in public hospital medical wards throughout the province. Because doctors in peripheral hospitals are so accustomed to dealing with AIDS/TB-related problems, the patients we review often have other diagnoses, more familiar to physicians accustomed to First-World medicine. 10. How did experience overseas compare with medical practice in KZN? These were locum hospital consultant jobs, mainly in the UK NHS. The level of sophistication is much greater than that of public health services in South Africa, and the government should be wary of introducing an unaffordable national insurance system before putting its own health service in order. That will take some doing. Instead of jet-setting, one now prop-hops. Travel abroad confirmed the beauty and importance of South Africa, and how much further one might contribute here. Robert (Doc) Caldwell is a physician living in the mist-belt of the KwaZulu-Natal Midlands. 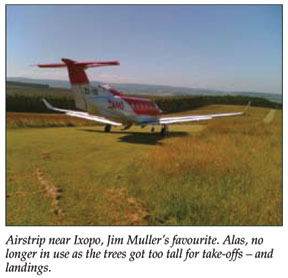 After a quarter-century of private practice in Pietermaritzburg, he did locums round the world for six years. At the start of 2007 he exchanged jet-setting for prophopping, via Red Cross AMS flights. He writes erratically to his Aunt Ethel.